As you said John, "Pity the poor historian" so don't feel bad about your Bathurst book, it is a wonderful piece of work for which you should VERY highly commended. If you have neglected to mention a few cars which were probably late entries and not included in the programme don't feel disappointed as the balance of the book must be 99.9% correct and no matter how much research you put into these things when they appear in print there will always be some clever people who will say " I could have told you that "
Tyre marks seem to match up on the last 2 photos, so unlikely they were different meetings. In my opinion, Easter 1955 for the top pic, because I think that shows John Ralston's MG Special leading Reg Hunt's first Maserati , and that Maserati ran only Easter 1955. Jim Johnson's hard driven MGTC is the other. Do we agree that all the pics were taken at the same meeting? If that is so, then ...More research needed! 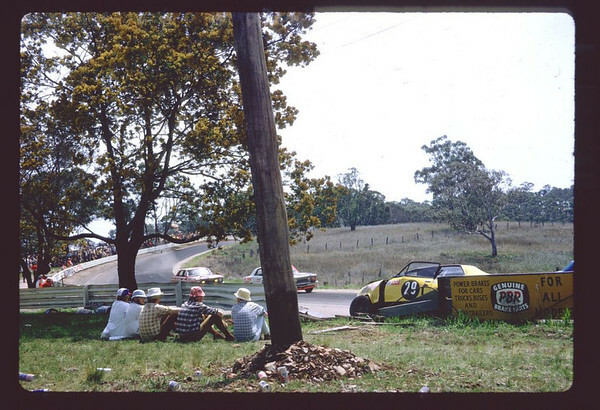 It's possible you're on to something with Ellis' friend's photos being from the Bathurst Easter 1955 meeting. All seem to have a similar amount of sunlight/weather conditions and track condition which would suggest the same meeting. Many of the cars currently mentioned appear in my race programme for this meeting and those that weren't printed have been diligently handwritten by the programme's original owner. An example being Reg Hunt, he isn't listed in the official entry list, but he's hand written into the '100' lap chart listing as #3. Austen Taurenac is also handwritten into event 1 as '48 A Taurenac Norton 498' plus 4 other written in. Including '13 M Ward Ralt 498'. The Jaguar shown is later than a Mk5 to me, Lou Kingsley is an entrant in event 2 with a Mk7 and Barry Gurdon is entered in an Austin A50 S/C. There's 4 Fiat 1100's printed (one must have been scratched)and Charlie Smith's #16 is handwritten in this event. So take your pick which one it could be in the 'Ellis' photo. The Gibson #10 Dodge is also entered. 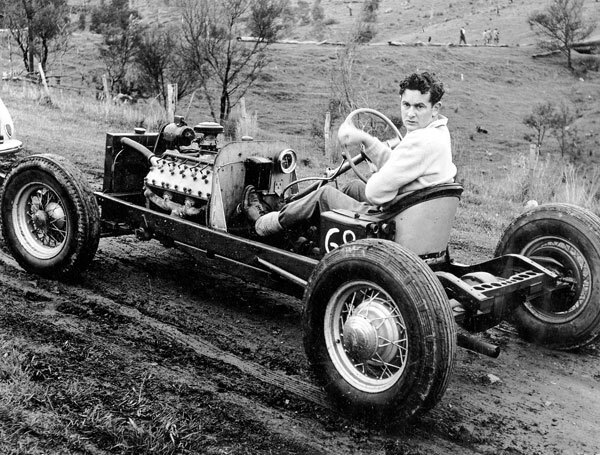 We led ourselves astray assuming Norm Rogers was the only car ever to hit the fence there, and attributed the straight-ahead-from-the-dipper-to-the-fence tyre marks wrongly to his October 1955 practice accident. The other fly in the ointment was the red canvas-bodied car we thought was Bill Ford's Hudson, actually the Ron Evans RVM-Riley which initially carried the Hudson's body, some say, and was driven by Bill Ford Easter 1955. The info has been emailed to the owner of the pics and is very much appreciated. Thanks Stan - hadn't picked that as the Sabakat! Here is another Mallala photo - not sure of the date but it may have been a 1962 meeting. I'll stick my neck out and suggest it's the start of a "Sports" Car race? #12 ... Noel Hurd, Zephyr Special. Edited by onelung, 22 May 2010 - 11:41. 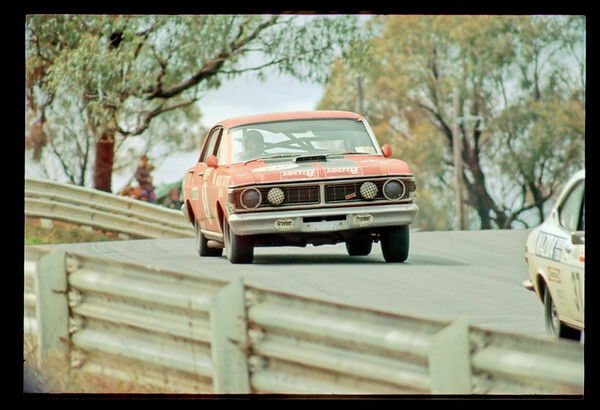 Would that be the car that Jim McKeon raced with a Holden engine at one stage. I don't think #12 would qualify as being a Sports Car in that guise, no guards, lights etc. Which Noel has restored very nicely and still owns. Multiply diff ratio of 4.1 by first gear ratio and on some smaller road cars you are getting toward 10.1. Lee, as Ray says, I think you need to have worked with the system to have a valid view of its merits or otherwise. The drive shafts on my Elfin have large donuts with centralising balls at the inner end and conventional UJs at the outer end. Over the past 37 years I have broken UJs on two occasions (as you say - not a pretty sight!!) but have never come close to a Donut failure and have needed to replace far fewer Donuts than UJs. They are not easy to work with, take up a lot of space and can have a minor influence on spring rates but, in my experience, they are completely trouble free and certainly not an accident waiting to happen. I did have one of the smaller Elan sized Donuts fail when driving the Dawson Damer Lotus 25 a few years back but, as I recall, it did not at the time have the centralised locating balls which are essential to make the system work satisfactorily. It's fabulous seeing these colour shots materialising after all these years. I suppose people think, oh they're just my snaps, and leave them in the closet until one day they finish up in a skip. As a keen if not very good photographer, I think even the feeblest snaps of almost anything have historic value. 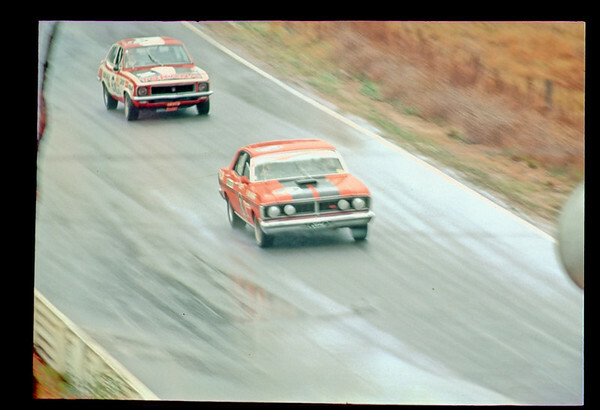 Colour racing photography from the 50s and 60s, before colour was common in magazines, is beyond price. Wonderful! and the photos in the Dacre Stubbs collection (especially page 13 on from Australia) are amazing. Others may be aware of this collection, but I certainly wasn't. Long before my time, but totally fascinating. Maybach 1, Lex Davison with hair, Patto in an MG - superb. Thank you very much! I don't know about you, Terry, but I'm much more impressed by seeing the detailed shot of the Kaye Special! And will someone please let them know that the 'unknown person' is Clive Gibson? Edited by Ray Bell, 23 May 2010 - 14:40. Have a look at www.collingrovehillclimb.com.au There is some very good shots including Alec mildren, Stan Jones, Bill Patterson and Kaydee in Morris Minors! And atajura.org.au for bikes on the hill. Last year. Which i did not know happened , I thought that sort of thing happened in the 50s. good to see. 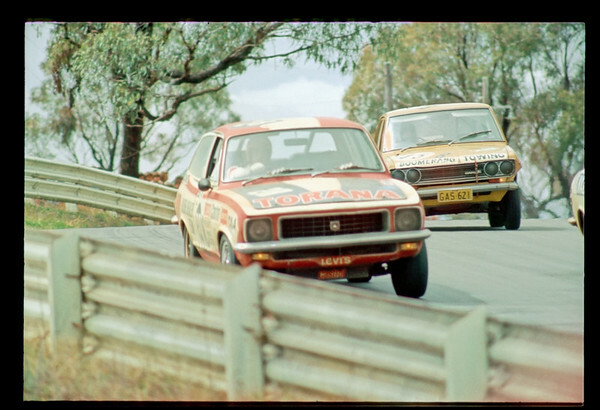 If you google 'Collingrove hillclimb' you will find a few more interesting sites. What can you tell us about the "special" in this pic? When built and by whom , where raced etc. 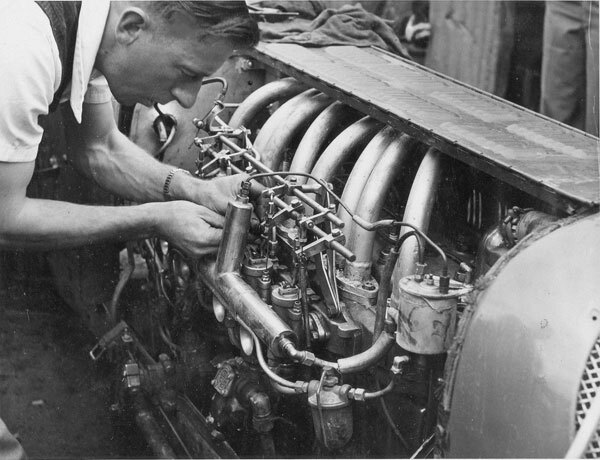 Appears to be an early Ford based car with a Ford "banjo" rear axle , 35 Ford wires , and what appears to be a Lincoln Zephyr V12 engine. Depending on year could be a cubic capacity of 267 -306 ci. Front end is non Ford given the parallel semi-elliptic spring and knock-off wire wheels . Frame looks a bit like a late 20's Essex. They came fitted with the chassis reinforcement on the lower edge of the frame and were relatively straight rails as appears here. Edited by fredeuce, 24 May 2010 - 01:08. I'm sure you will remember right about now that Doug Whiteford's daughter's name was Kaye. Yes, it's a Lincoln Zephyr engine, the steering column was said by Jim Gullan to be unsupported in his book, but it looks to have some supports in this pic. Albeit, ones that still might allow a lot of movement at the steering wheel! Another angle on the donut debate. Here is a link to a site where a big crash was blamed on donut failure. I dont know if this particular set up had the central ball or not. Scroll down to the last few photos. The photo of the drive shaft and the broken donut appears to indicate that there was no central locating ball. If there had been one there would be a protruding locating tube on the inner end of the drive shaft. The photo shows no evidence of that or any indication that the locating tube has simply broken off. The Yellow car is not any RALT driven by Ron or Austin Tauranac. 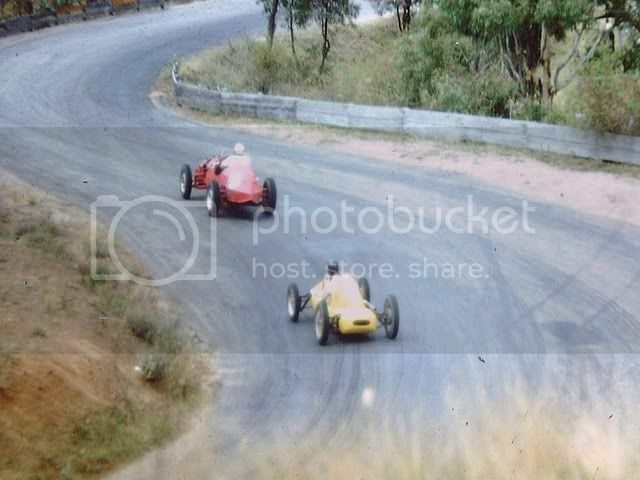 1951 Ron drove Ralt 1 and the back end i nothing like this pic and the exhurst came out on the leftside ,also Austin drove Ralt 2 a black sports car at same meeting. The car shown is the ex Jack Hooper 500 much modified by Ron and Austen and entered by Austen as a Norton Special -- although some then and now called it a Ralt fom time to time. That bloke Doug Grant, who was at one time Mister Ralt in Italy(hence Eldougo), called it Ralt 3 in John Blanden's Historic Racing Cars in Australia. While still not my preffered method the donut with a ball seems commonsense and should not cause all sorts of weird drive vibrations and torque charactaristics. Funny, the Porsche 917 seemed Ok with donuts. The Brabham BT 26 ran donuts with the DFV motor. Probably brought about by ill-advised cost cutting. Great shots as usual . Keep them coming. The car is owned again by the original builder and restored to as new. 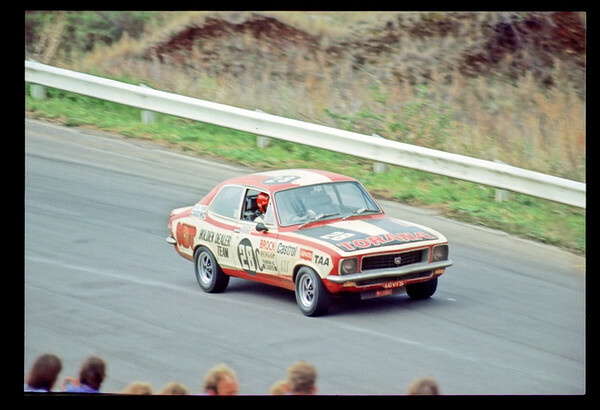 He brought it to the Symmons Plains 50th a few weekends ago. Pretty sure the rest of the circuit remains as it always was. It always amazed me that the way one entered the circuit at one stage in its history (pre motorcycle GP era/ Bob Barnard reconstruction which created the tunnel)was across the race circuit somewhere near The Hayshed. I recall thinking as I towed my mud dropping trailer into and across the circuit that i was probably going to need a clean piece of road in that area come race time. But where exactly was that? Main reason for it all was seepage from the dam undermining the track at that point, I think you'll find. This shot was taken Monday 9th October 1961. It is event #7 of a two day (Sat. 7th, Mon 9th) meeting. Events 1 to 5 run on the 7th, and 6 to 8 on the 9th: event 8 being the Australian Grand Prix. Event #7 was titled “Racing & Sports Car Race” .. 10 laps, with an internal handicap event over the first 8 laps. Edited by onelung, 26 May 2010 - 07:30. That is also my recollection but the other change which made the circuit faster was to open up MG which used to be tight enough for some cars to use 1st gear there. It was opened up to suit the bikes. He had a long and varied career when you think about it. According to Blanden, Lou sold it to Bryan in Feb 1960. Elfin driver was probably Garrie in a Formula Junior as he was a DNS in the GP with gearbox woes after qualifying 8th. Yeah,great meeting place,big fire i doubt there's much left. Edited by Ian G, 26 May 2010 - 23:34. Agreed, the rest of that beachfront strip has became like that. 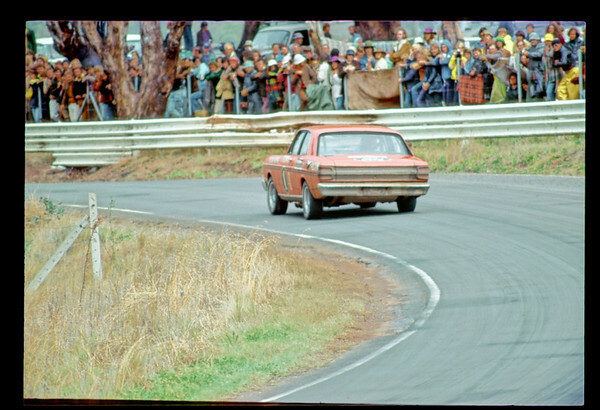 Perhaps Mick can identify the officials - I assume they were all officials ..
All taken at the same Bathurst ... 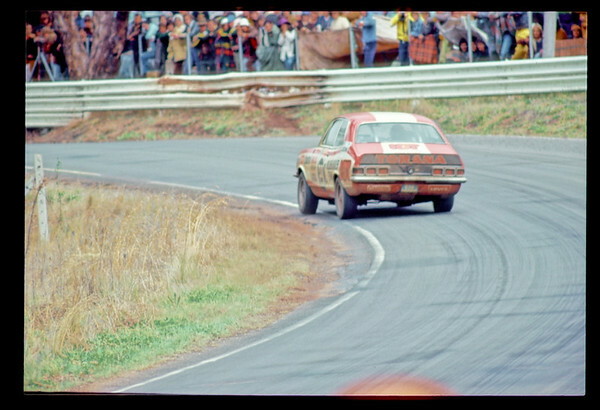 These are the only useable Bathurst ones, sadly. The others were all taken with a stock 50mm lens and the action is too far away. I should have some decent B/W photos, but I am still looking for them. But I doubt that Mick will know any of those blokes, I was an official at that time, flagging every meeting at the Farm and on occasion at Bathurst and Oran Park, and I wouldn't have a clue. Nice shot, well recalling the way some cars had garish paint on them to make them more visible to crews as they headed to the pits etc. 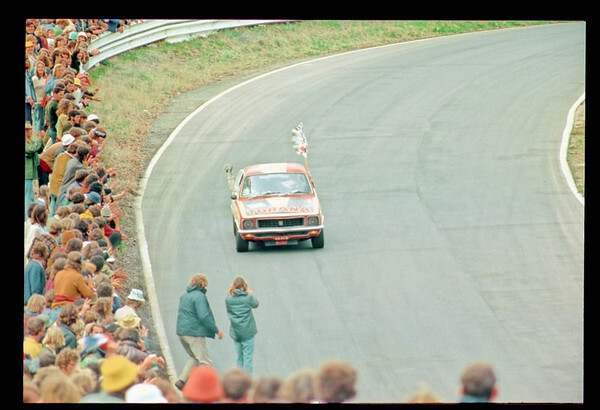 And your other pics came up while I was posting... some nice stuff of Brocky's first win there. Gotta love that Datsun, and how did you get up the Shell Tower? Sorry, I think it was Castrol by then. Edited by Ray Bell, 28 May 2010 - 00:45. Thanks Ray, yes I had forgotten you spelt his name with an 'a', I was thinking 'i' - too much time spent working in Canberra . I like the Datto too, I had one at the time. Interesting it is running with its number plates, I notice other cars appear to have rego stickers but no plates. My question about the officials was a little tongue in cheek, but this is the net and you never know! All taken from GA areas sadly I had no access to restricted areas - just a kid with a camera. The one that looks like it was taken from the Tower was shot on the run down to Forrest's Elbow, the long lens (300mm? no exif in those days haha) gives the impression of heigth. I especially like the state of the armco in 4 & 5, looks a bit rusty so might have been from previous year? I would hope not, but things were different then .. I will post up a few from the Dulux when I have a bit more time. That Falcon shot is weird, the cage seems nonsensical and there does not appear to be anything in the background to give odd illusions. At a guess the cage [or half cage possibly] would be main hoop , a diagonal and two supports to the rear parcel shelf. Now compare that to Thupercar!! Yep, that's a typical roll 'cage' of the time. Looks to me like Brock's car only has a half-cage too. That crash destroyed John Keran's career - he broke his leg very badly. Those are GREAT photos considering the old technology and the short lenses. And especially considering you were in the GA areas.